I'm a big The Simpsons fan and am stoked that the first big Simpsons game is now available for Android smartphones and tablets (especially considering that iPhone and iPad users have been playing it for a while). Read on to find out what we make of The Simpsons™: Tapped Out. The required permissions strike us as perfectly straightforward; internet connection is required. I'm a massive Simpsons fan—always have been, since I was a kid, and I'm pretty sure I know every episode, having seen many of them several times. And the fun thing is that I know Simpsons quotes for almost every situation I might find myself in. Anyhoo, on to the game. The Simpsons™: Tapped Out comes with its own little narrative: Homer is at the plant, busy playing “Happy Little Elves” on his myPad, and thus misses an explosion in the reactor and causes a meltdown. Oops. Springfield, as a result, is literally wiped out by Homer. The goal is thus to reconstruct Springfield exactly as it was before Homer fell asleep on the job. Before I go into specifics, I'd like to point out that the characters' voices all sound just like the ones we all know and love, and the animated intro and interludes are very much in true Simpson style. The game's humour is also in the same vein as the original TV show. For instance, Homer is annoyed with the “Happy Littel Elves” game because he finds it too monotonous, so he shells out and buys a bunch of berries that are meant to speed up the game. By the way, there's some metatextuality here, in the sense that in the real game – The Simpsons™ Tapped Out – players also have to pay for a food item (Donuts) to help speed things up/be able to access certain items. Homer's first priority is rebuilding his own home. Once he has accomplished this, Lisa appears, eager to help dad. 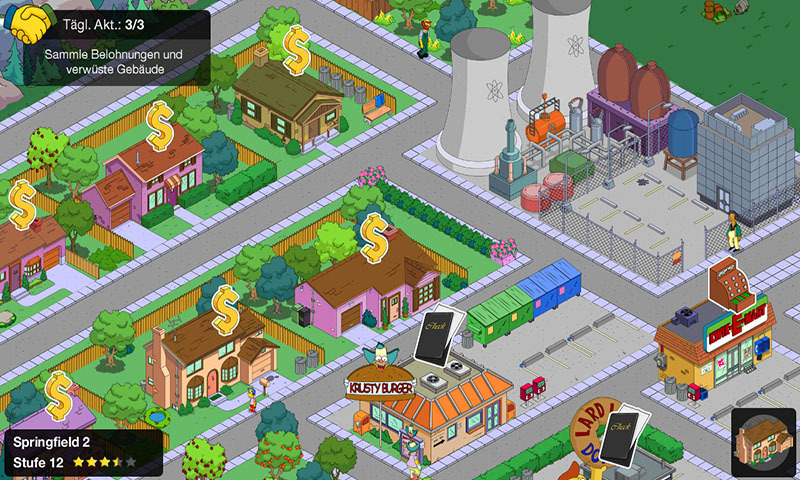 Little by little you will need to unlock more buildings and objects so that you can rebuild Springfield. You can build it to resemble the Springfield from the TV show, or else let your imagination run free and build it according to your own ideas. New characters can do various actions (usually by interacting with buildings and objects). The times can vary from mere seconds to 24 hours, and will afford you money/points. Constructing new buildings will also take different amounts of time. A fun feature: Every 24 hours you can jump to an alternative Springfield and interact there for a short period of time. We appreciate the attention to detail and that the app stays true to the unique, classic Simpsons style humour. For instance: some of the characters poke fun at the game, and Homer wines about having to participate in rebuilding Springfield, wishing he were a shooter-game hero instead. I'm a bit sceptic in regards to the newest Simpsons episodes, which is why I was pleasantly surprised that the game references many of the older episodes. The Simpsons™ Tapped Out comes with plenty of items, from a lemon tree all the way to the Jebediah Springfield statue. And while we recognise the many cool qualities this game can boast, we do have to point out that the game principle itself isn't new. 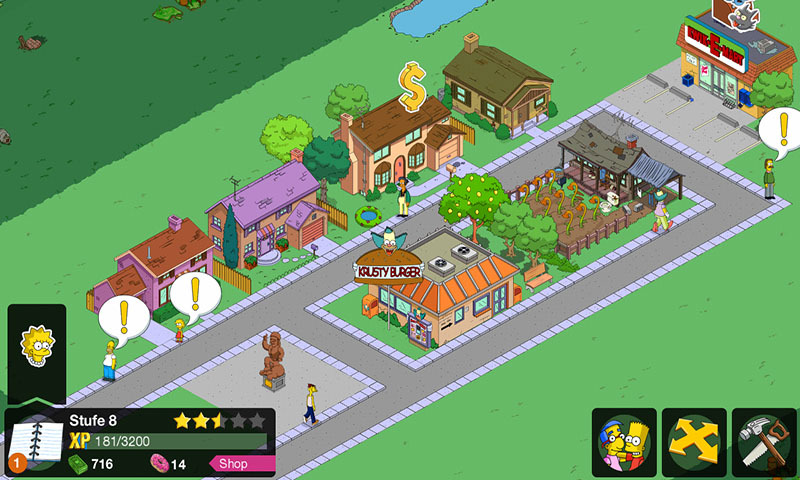 The Simpsons™: Tapped Out isn't going to wow you with it's ingenious new gameplay, but it sure is fun to construct one's own version of Springfield. The characters, buildings and items are plentiful and nicely thought-out, and the details – including Itchy and Scrathy – are a hoot. Oh, and hey: Try tapping Homer 10x consecutively. The cool thing is that the game really looks like the show. The Simpsons' house looks just like what we've all grown up with, right down to the details (of the façade, that is, there's no going into any of these buildings). The characters are also nicely animated. The only issue we had was when zooming in, upon which The Simpsons™: Tapped Out looks a little fuzzy on the Galaxy Note 2. Controls are great and very easy to get the hang of. 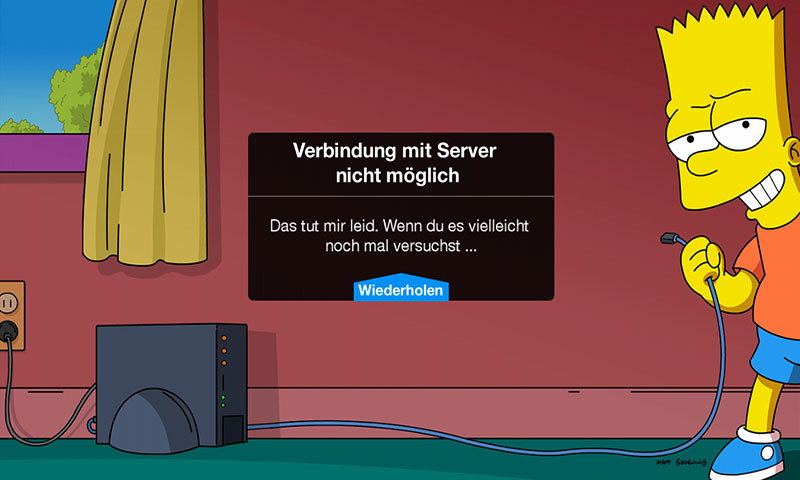 We didn't have any stability issues with The Simpsons™: Tapped Out. At one point – and only briefly – it wasn't possible to set up a connection, but aside from that the game ran smoothly throughout. The drawback: The app can take a while to load. You need to count about 20 seconds in order for the game to start. The Simpsons™: Tapped Out is free from Google Play, and it doesn't have any ad banners. That said, many of the buildings and objects can only be bought with Donuts (€2.27 for a dozen, €100 for 2,400 Donuts). Just so you get an idea of what this pans out like: Professor Frink's lab costs 150 Donuts. There is also a game currency to be purchased, but you can certainly do without it. I was more miffed by the Donuts, seeing as there are many items that can only be purchased with Donuts.